Here are pictures from PyCon 2013! I am so jet lagged. Hope you enjoy! I’m sorry for the late post. This time change is killer. I am in California right now attending PyCon for my University. It was a whole day of flying yesterday, and the first day of the conference has gone amazingly well. Eben from the Raspberry Pi Foundation gave the keynote. It was great. I’ve put my PiMAME code and configurations on GitHub for anyone to look at, check out, fork, make improvements, etc, etc. If you check out menu.py, you will see that I have a new line item for RetroPie / EmulationStation. I am testing it out in addition to AdvanceMAME. Shael Riley and Beefy from The Grammar Club have just released their new album. I’m friends with Shael and am a huge fan of Nerdcore. I hope you enjoy! I met No Starch Press at PyCon 2012 where they were showing off chapters of their then upcoming book, Python For Kids by Jason R. Briggs. I was talking to them and expressed interest in getting a copy for the students in my department at the University. At the end of December the book started shipping and No Starch was kind enough to contact me and send me a copy. I have to say that I think the book is great. It has 18 chapters and is around 300 pages, with the book split up into 3 parts. The first part is an introduction to Python 3, the syntax, as well as standard programming conventions like loops and variables and functions. It also goes into modules, turtle graphics (like the LOGO language of old), objects, classes, and the tkinter GUI library. The second part gets to the fun activities you can do with Python like programming games! All the chapters in this part of the book are about using tkinter and Python to make a pong / arkanoid like game and it walks you through every step of the process. The third part of the books builds upon the previous game, and teaches the reader how to make a simple platforming game, complete with sprites, animations, and events. I REALLY liked this book. I tried to read a chapter a day, and I kept having to stop myself because I would say just one more chapter tonight… (I like to pace myself). I feel the author really captures what a kid would like to learn about and presents it in a manner that will keep them entertained, motivated, and interested. I do have two very minor nitpicks about the book that stayed with me while I was reading it. The first one was the lack of explaining types. The author dives right into strings, and ints, and floats, but doesn’t explain what the difference is between them, or why you would use one over the other. I think a simple introduction and type chart would have made the first part a much easier read for a beginner. The second nitpick* is that the last part of the book ramps up the difficulty. You do get a finished game out of it, so the challenge isn’t for nothing, but I still found it to be a bit jarring after breezing through my reading of the earlier chapters. Barring those two very minor issues, I think this is a fabulous book. For a programming book, it is on the inexpensive side, at around $20, and packs a good amount of material for the price. I recommend it. *A good friend of mine told me that I’m not looking at this one through kid glasses. They would probably have no issue with the difficulty ramp up, and would in fact welcome the challenge. You all know I’m a huge Kickstarter fan. This week has proved to be an awesome time for projects (and a sad day for my wallet). Two projects caught my eye, the first one is the 3Doodler. The 3Doodler is a hot-glue-gun like device that uses a plastic extruder to create 3D shapes in air. The plastic extruder is one that you would normally see in a 3D printer like the Makerbot, but has been adapted to be handheld. Because the plastic cools rapidly, it can create sturdy shapes that can be drawn anywhere. It already surpassed the million dollar mark, so I have high hopes for this project. I backed it at the $75 October level, so I hope to get mine then and be able to do a review of it. 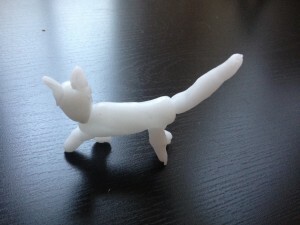 If you are into 3D Printing and artwork, you may want to consider backing this project! Another Kickstarter I backed this week is a project for the Raspberry Pi. It’s an on/off switch that talks to the Pi via GPIO and activates a safe software shutdown before cutting power. I’ve talked to the creator, he’s a member of the Raspberry Pi forums, and is quite excited about this project. It’s $22 for this batch of boards. If you are looking for a power switch for your Pi, this may be it. I have a cool piece of hardware to show tomorrow. Looking forward to sharing it with you all! Happy Friday! I am going to spend most of tomorrow in bed. I’m beat. Grad School is great, but exhausting. Working full time, school, and hobbies (plus my upcoming wedding) is insane. And yet, I LOVE every second of it. Tonight I had a well deserved date night with the fiancee. We went and saw the movie Warm Bodies. It’s a Zom-Rom-Com, like Zombieland and Shaun of the Dead. I highly recommend it. I forget where I saw this product initially, but once I started reading up on it, I had to have it. Instamorph is mold-able reusable, quick setting plastic. The product comes as plastic pellets which you pour into just below boiling water. When the plastic becomes clear, you can take it out and mold it into any shape you want. As it cools, it hardens and turns white. Kristene made that in about 5 minutes. I’m going to use it to make standoffs for my Raspberry Pi within the DeskCade. Not much to write about this week. Halfway through the Python for Kids book, will be writing a full review once I get through it all. My graduate course is ramping up, but I’m still loving it. Working out the kinks on the Tankstick, like the fact that when I tried to play SF2 with my fiancee, the second player buttons wouldn’t register in game…whoops! Now onto the meat of the post! If you have never been to Seeedstudio.com, you really should take a look. They are an open hardware manufacturer If you have an idea, and can make a prototype, they can probably mass produce it for you. They are currently selling preorders for a Nano Quadcopter. At work, we have a couple of the $20 RC Helicopters that we play around with whenever we need to take a break. We always wanted to get a quadcopter for the office, but most of the time, they are very expensive, too big, and not a full kit. The size being the biggest factor. This new quadcopter comes with everything you need, is open source, inexpensive, and best of all, fits in your hand! Today I’m pleased to introduce a partner site of mine. Sheacob.com is a collaborative blog between myself and my friend + coworker Jacob Bates. Jacob is a coder, photographer, embedded electronics enthusiast, and an all around good guy. We have been working together on some projects for the past year, and are finally making a place to debut them. I hope you look forward to some of our creations. We got tired of having to hook up a screen to the Raspberry Pi, or go into our router, just to find out its IP address, so we decided to write this simple script. Basically, your Pi sends its local IP address to the site every time it boots, then you visit http://pip.sheacob.com site on your main computer to view it. We aren’t storing any personal information, it’s just the WAN address that your computer sends when you visit any website (like whatismyip.com) and the internal IP address of your Raspberry Pi. Once installed, all you have to do is goto http://pip.sheacob.com to display the IP your Raspberry Pi has. We hope you enjoy it and it helps out some people. Let us know if you have any questions, comments, or suggestions! My book, Raspberry Pi Gaming (2nd Edition), is now available! Political advertisement paid for and approved by Shea Silverman, No Party Affiliation, for Florida House of Representatives District 49.